Samocat Sharing, a resident startup of the Skolkovo Foundation’s energy-efficient technologies cluster, is expanding its kick scooter sharing scheme to the Finnish city of Espoo. 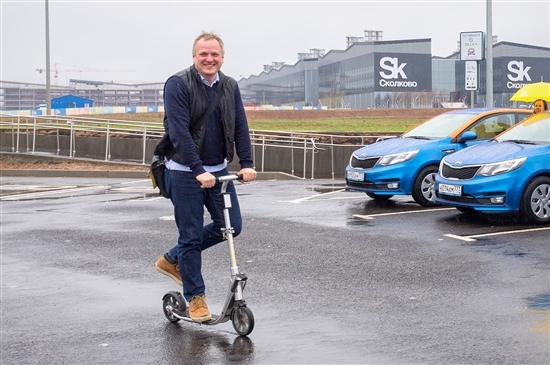 Sergei Pisarenko, cofounder of Samocat Sharing, rides a scooter around the Skolkovo innovation city come rain or shine. Photo: Sk.ru. Samocat Sharing, which takes its name from the Russian word for scooter, already has rental stations around the territory of the Skolkovo innovation city outside Moscow. Now it is launching a joint pilot scheme together with the City of Espoo that will run from August to November. Sixty foldable scooters will be made available for use by residents of the city’s Otaniemi district, many of whom are students and teachers at Aalto University or employees of the local technopark. The scooters can be rented via the Samocat Sharing mobile app and payment is by card. Renting a scooter costs 0.03 euros per minute, 1 euro per hour, 10 euros per day or 30 euros for a week’s rental. Samocat’s founders believe that kick scooters have several advantages over bikes: they are cheaper and lighter, and can be taken on the metro and other forms of transport. In addition, their stations take up less room on the streets or inside buildings. The company promises a pay-back period of less than one season for buyers who install a scooter rental stand in busy areas. In Espoo, the pilot project is financed by the municipal government and Aalto University. A Samocat Sharing stand inside the giant Skolkovo Technopark. Photo: Sk.ru. Harri Paananen, economic and business development manager for the City of Espoo, said he was very pleased that Samocat Sharing had chosen the city for its first pilot project in the European Union. “Espoo is a city of high education and expertise. Openness, experimenting and looking for new solutions are vital to us. Innovation is at the heart of Espoo,” he said. The expansion to Finland grew out of the Slush startup conference in Helsinki, which Bykov and his cofounder, Sergei Pisarenko, attended in November together with many other Skolkovo startups. At Slush, Samocat’s founders met with representatives of Tekes, the Finnish Funding Agency for Technology and Innovation. Soon after, a delegation from the Helsinki Business Hub visited Moscow, and contacts with that delegation eventually crystallised into a specific plan. “Helsinki Business Hub works very efficiently to attract new companies and investments to the Helsinki area,” said Pisarenko. “We were basically able to meet everyone we needed to: all of the Helsinki region innovation scene around one table. That helped us come to a quick decision. We know that there will be challenges but that’s why we are running a pilot first,” he added. If the pilot scheme in Espoo – located 19 kilometres from Helsinki – is a success, Samocat Sharing plans to expand to the rest of Finland, and then to Sweden and Norway, followed by other EU countries. The startup also has operations in New York. “The Skolkovo Foundation is actively developing ecologically friendly transport,” said Ilya Kiselev, a senior project manager within Skolkovo’s energy cluster.